This Diwali flaunt your swanky ensemble and uplift your mood amidst the enticing aura of lights. 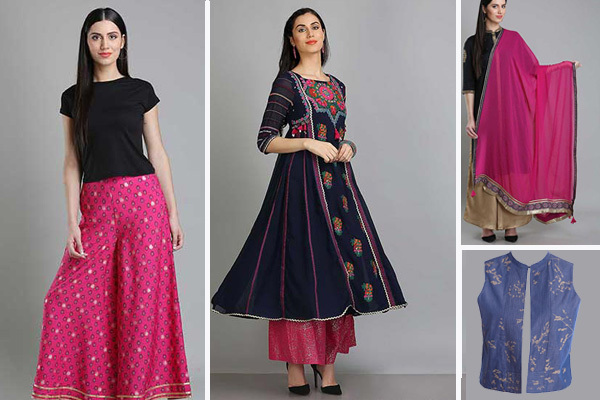 To update your festive wardrobe we have shortlisted some brands in Elanté where you can spot your perfect GO DESI attire for this festive season. Girls, attractive festivities offers are on in Elanté. Find the details below. 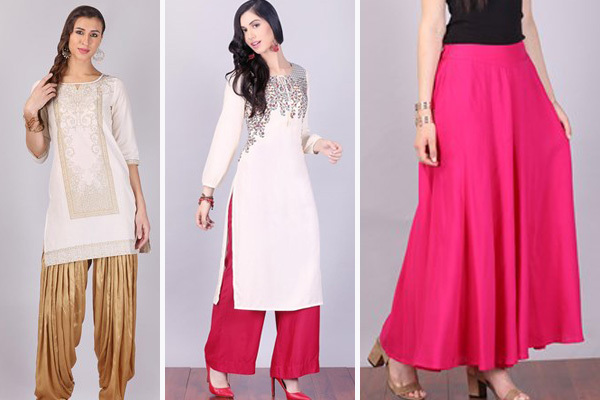 So, what are you waiting for ladies embody the charm of being a women and embrace yourselves in your Indian outfits. India’s best selling brand Fabindia, celebrate beautiful and authentic range of products for this festive season. They have curated brand new RAJWADA COLLECTION which is craft-based, contemporary and affordable. Not only this they have some amazing sale products at relatively low prices to satisfy your appetite for ethnic products. So, what are you upto guys? Hurry up and get festive attire of your dreams. How to style the look? Bring on some festive fervour to your looks by pairing a cotton silk embroidered long kurta with tussar cotton tie up pants. Add some leather mirror criss-cross jutis as they complement the whole ensemble. Lastly, amp the look by adding some statement jhumka earings which are hard to resist and silver ring which is true classic. Worried about upcoming festivals? 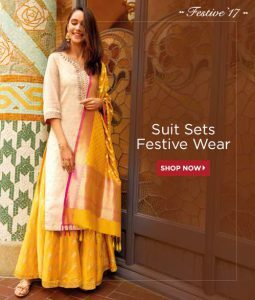 Hold on, you don’t have to stress any longer as Biba has got big Diwali sale where you can avail upto 50% off on festive fashionable ethnic outfit. Biba aims to treasure and celebrate Indian women and their femininity. So Girls, it’s time to set on fire and revamp your boring Indian outfits with unbeatable choices at amazing discounts. 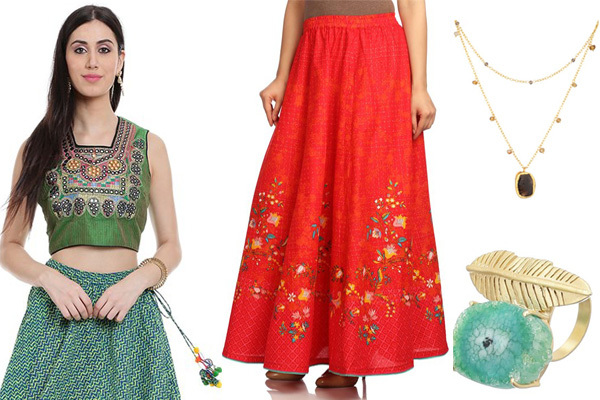 Be the heart of all festivity, dress in an crop ethnic top which is rich in design with a heavy flared skirt on. Enhance the look, by adding a couple of accessorizes including alluring gold plated layered choker necklace and chunky gold plated green ring. 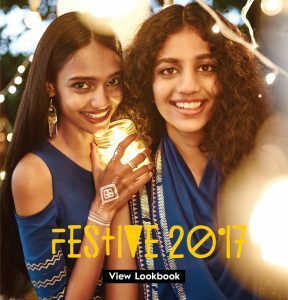 Desi unveils huge sale upto 50% on it’s fabulous and striking festive collection, which is high on energy with vibrant festive colours and promises vivacity. 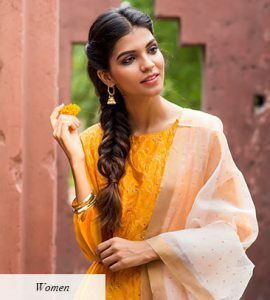 The boho chic brand aims to bring aesthetics of Indian wear to your wardrobe this festive season. 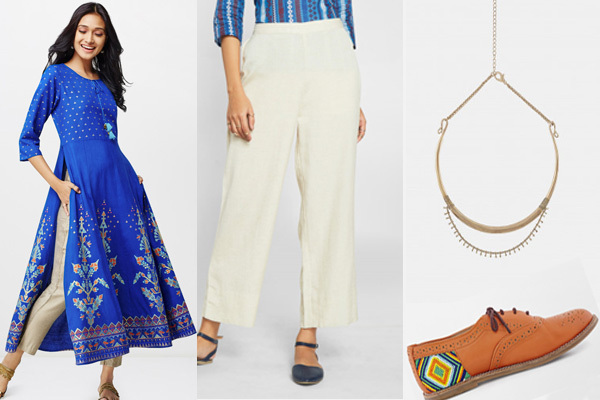 Buck up girls, and invest on your mandatory Diwali outfit as this sale is surely a steal. This festive season slay with your indo-western fusion look by pulling off a three fourth sleeves kurta with high slits on both sides. The abstract printed kurta with tassel tie up detailing can be paired with crop length trousers. Add a pair of tan beaded patch oxfords with heart cut out detailing. Lastly, finish off the look by adding a gold accent necklace to add the element of edge. 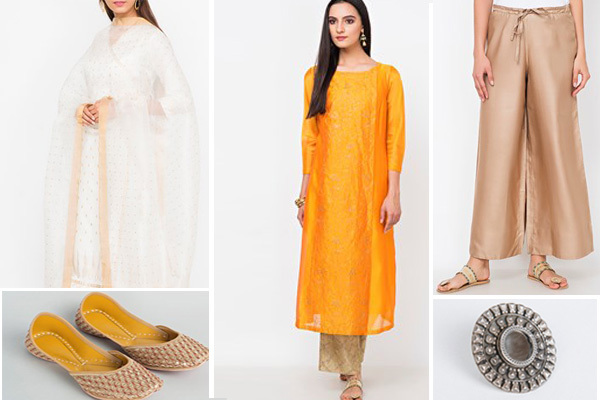 Celebrate womanhood with contemporary Indian ethnic wear at W with flat 30% off. W has introduced Mughal gowns with dramatic flair, sequined detail and flared hemline this festive season. It’s time to twirl with grace and outshine with their unique innovation. Make a statement this Diwali in your three fourth sleeves anarkali tassel detail and lace up detailing kurta with heavy flared palazoo pant. Add a heavy contrasting dazzling drape to the ethnic attire. Also, a classy subtle waist length gillet adds a freezing glamorous touch to the conventional styling. With its’s root grounded in rich heritage of traditional Indian crafts and designs, Aurelia, this festive season has introduced the most awaited sale of flat 30% on selected styles. So, redefine your ethnic outfits with expansive and vibrant collection at Aurelia. Offer a lasting impression and stand out with flattering colours and subdued tones. Dress yourselves in white full sleeves embroidered long kurta or a three fourth sleeve kurti with printed detail and keyhole. Pair it with pink full flare skirt. Lastly, finish off the look with pink dupatta with tassels along the ends and you’re ready to shine. Shrishti is a literature novice with a keen instinct of fashion. Currently pursing her graduation in English honours, she is a budding blogger and a frivolous personality. In never-ending love affair with everything and anything and paving her way to get established in this vivacious world.